Many people have often wondered if Lulu Bea is my real name, so I thought I’d share the story behind it. No, Lulu Bea is not my birth name, but Lulu is a nickname that I’ve had since childhood. My mother added it onto the end of my first name and, as nicknames often do, it took. It was not a nickname that was used in lieu of my first name though. 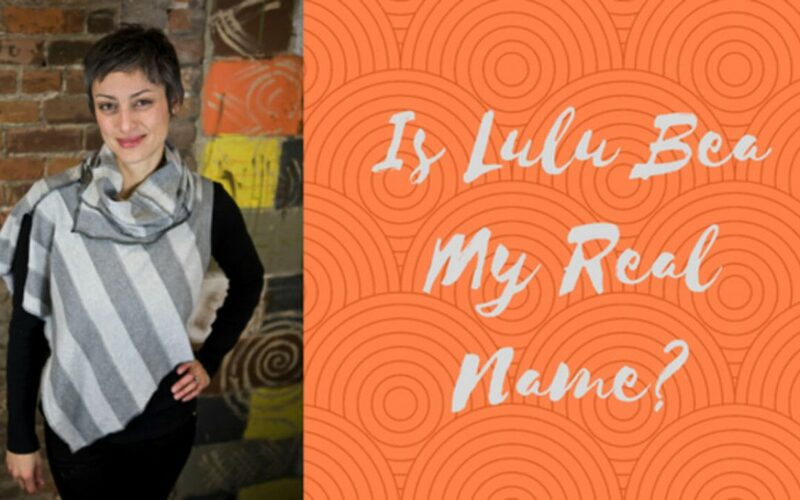 It wasn’t until I had nieces and nephews that “Lulu” reemerged for them to call me “Aunt Lulu.” Nowadays, some family and friends call me Lulu, but it is mostly a name that is used within my business world. Because I had a stalker. It quite possibly was a case of misunderstanding where he just wanted to tell me his side of the story, but my parents insisted on my being safe and taking matters to the authorities. So… that’s what I did, and it eventually went to court… twice. He was deported, and since then I’ve tried to keep personal info private to protect my family. Kind of impossible in this day & age, but hey, I try. When the urge came to start my own business, “Lulu” seemed like the natural choice. I went by “Lulu” alone for a couple of years, until an art show asked me for a surname. I asked why it was needed, and they basically said that they didn’t feel comfortable with me only having a first name. Um… okayyyy… So you just want me to make up a last name??? “Lulu Mimi” didn’t quite flow. “Mimi” was the nickname us grandkids called her. Her real name was Beatrice, and I remembered hearing one of her friends address her as “Bea,” and thus “Lulu Bea” was born. She lived until 2 months shy of her 100th birthday, still in her own apartment. She played tennis well into her 90’s. She aged gracefully. When part of her bicep detached while playing tennis, and surgery was not an option at her age, she decided she would just wear a band to hold it in place when she played. 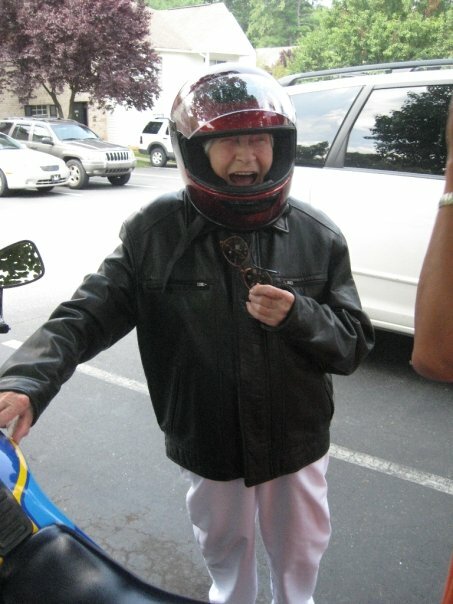 She took her first motorcycle ride with my dad when she was 98!!! She was very creative. She sewed us clothing, made us teddy bears, knit us sweaters/mittens/scarves, crocheted us blankets, cooked delicious food – even froze meals to send with us at college – all with progressive arthritis and hardly a complaint. She used terms of endearment with us like “tchotchke! !” and “gorgeous!”… usually while giving us a kiss on the cheek or a big ‘ol hug. She gave up driving at a young age because she preferred to walk everywhere, keeping herself fit at the same time. This was in addition to her morning workout ritual that was something crazy like, 100 leg lifts per leg and 50 sit-ups, which she completed before getting out of bed each day. She loved sudoku puzzles and playing bridge… oh, and scrabble. We played a lot of scrabble together when I’d get to have a special sleepover, and I don’t think I ever won. She had a laugh that exuded pure joy and delight. Can’t you just feel it? – She had a Facebook account… Yep!… she was hip with the times. She also skyped with us regularly… though it was rare that we saw more than the top of her head because she never noticed when she was off camera. She had a love affair with Aldi, often telling us about the amazing deals she found there, and she always looked forward with excitement to her bi-weekly trips there with my dad. She enjoyed the simple beauties in life, often finding excitement in every day occurrences. Mimi passed away in 2011, so she never saw that I chose Bea as my surname… but she knows. She knows. I feel Mimi around me all the time. I know she is proud of me and of what I’ve accomplished thus far. While writing this post does make me cry, it is only because she was so amazing to know, and remembering her brings me happy tears full of love. I often think about how inspirational she was to all that knew her… and I wonder if she even knew. When I ponder what my life’s purpose is, and what steps I should take next on my journey, I often think about Mimi and how she just lived her life being herself. You know… maybe that’s what it’s really all about. We all aren’t destined to create world change on a grand scale. Living a life of purpose and meaning is not directly correlated to the number of people you know, or the number of “likes” you have on Facebook. .. and that sounds like a life well lived.